Please pardon this terribly cliched observation about reading: it's pretty amazing. Our ability to interpret the meaning of marks on a page or a wall or a screen... Out of sight, no? It's perhaps only when you encounter a child just learning to read, or a person of any age who struggles with reading in one or another language, or perhaps in any language at all, that the importance of this everyday activity is thrown into relief. 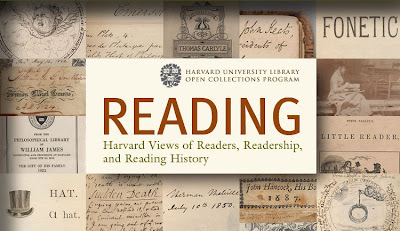 The Harvard University Library Open Collections Program has an interesting online collection called "Reading: Harvard Views of Reading, Readership, and Reading History." It's got some unusual historical books (available in their entirety online) about the science of reading, reading instruction, book clubs, as well as so-called "commonplace books," the marginalia (or writing in the margins) of famous authors, and more. Peruse 15 highlights of the collection, such as an 1878 phonetic reader, a letter from missionaries trying to teach Native Americans to read English, and Herman Melville's marginalia on a book about sperm whales. Or browse the menu to read any of the books in full. One volume that caught my eye was James Anson Farrer's "Books Condemned to Be Burnt" (1892). It's not as juicy as I'd first hoped, but the very title made me realize I'd never been to a book burning, and prompted me to think, however fleetingly, that I should organize one as a little provocation. Among the website's remarkable features is that it allows visitors to look at digital images of the actual pages of the published volumes, or click the "View Text" button to see everything in computer text. Aside from whatever interest the content of these books may hold for visitors, the site's very design suggests a direction for the public presentation of old and rare books. It's no longer just the fact of reading that stands out as, yes, pretty amazing, but also the way we read, and the easy access we now have to books (or at least their images) that, only a few years ago, would have required time and travel to glimpse. Thesis Writing Service can prove to be the most beneficial destination to fulfill all your writing needs. It provides students with the best possible assistance from its experts. Get your Dissertation Writing Service USA assistance and get best rating for your course. Project submission is something that a student finds very difficult. The task becomes tiring and tough when you have to submit more than one project at the same time. For more details click here - Dissertation Writing Service UK.